What is Cloud Management Platform? How to choose the right one? Cloud Management Platform or CMP is a term recently coined by Gartner to describe products or tools that help businesses to optimize and manage their cloud infrastructure for cost, security, and operations. A good Cloud Management Platform allows users to maintain control over dynamic and scalable cloud environments. 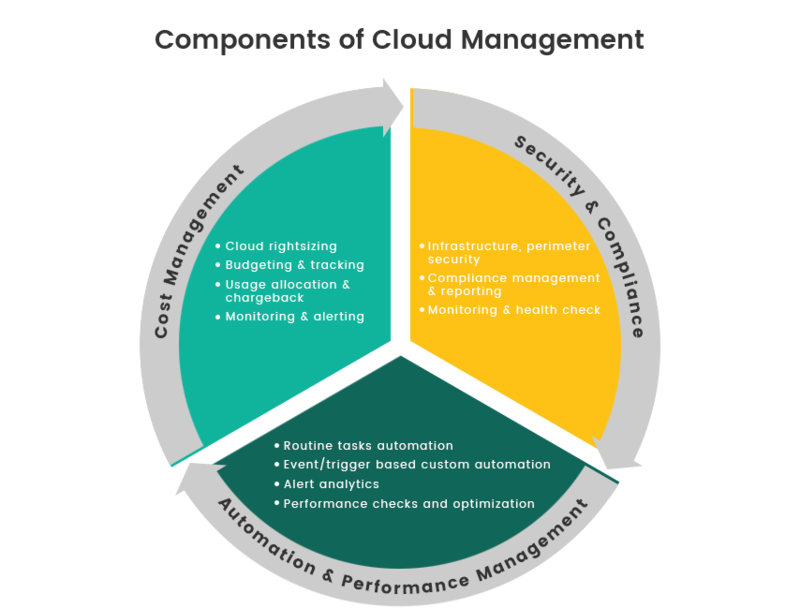 Major CMPs available today will cover some or all of the following aspects of cloud management. Cloud management is still in its early days and platforms are not created equal and can be classified based on the problem they try to address for customers. Platforms which offer only one type of cloud problem solving, for example, Evident.io does only cloud security or Skeddly that does only automation and cost optimization for Microsoft Azure. These platforms enable you to manage multiple clouds like AWS, Azure, GCP, IBM Softlayer and more. Botmetric which supports both AWS and Azure is a good example of this type. 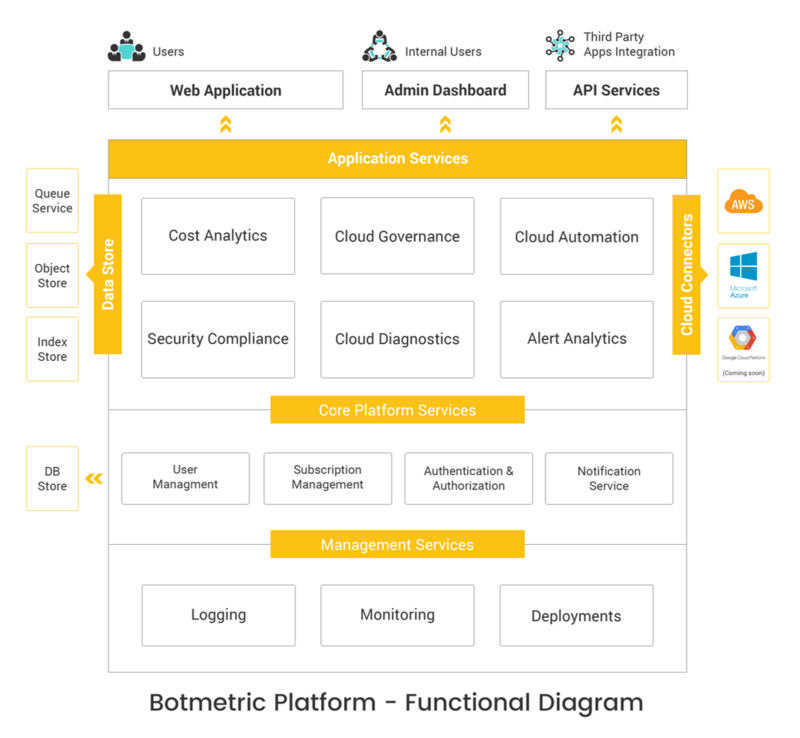 Attached below is a typical functional architecture of a Multi-cloud Management Platform like Botmetric. Platforms which support hybrid clouds as well as on-prem infrastructure fit into this category. Due to the complexity involved in the management of such an infrastructure, these tools rely heavily on custom implementation. This space is still evolving. Why do Businesses Need a Cloud Management Platform? In the early days of public cloud, migration to the cloud was considered the biggest challenge ahead of the eternal bliss of cost savings, flexibility, scalability and everything else that cloud computing had to offer. A decade later, it is established that cloud needs proper strategy and management to be productive. A lack of it even drove few companies to switch back to traditional data centers or private cloud before they figured out what their real cloud objectives were. So it’s established beyond doubt that migrating to the cloud is the easiest part. Lack of skills, knowledge, and expertise on the cloud is well documented. Managing applications involve a lot of repetitive tasks, especially for large environments. All this coupled with escalating cloud costs due to a combination of lack of visibility and a tendency to over-provision makes a CIOs job a tough one. Here lies the relevance of a Cloud Management Platform or CMP. How to Choose the Right Cloud Management Platform? Interestingly, just a few years back the most requested question with analysts were – ‘how do we choose the right cloud for my business?’ Today statistics show that most of these businesses are asking – ‘how do we manage the cloud?’ or ‘how to choose the right Cloud Management Platform’. As explained earlier, businesses realize today that cloud needs to be managed well for better efficiency, productivity, and security. Listed below are the top 10 considerations I’d suggest while choosing the right CMP. Does it cover all four pillars of cloud success like cost, DR, security, and performance? How long is the learning curve? Shorter the better. The depth of usage visibility & granularity of governance. Robustness of out-of-the-box runbook automation. Is it intelligent enough to understand when an unnecessary resource is launched? How fast does it detect open ports or security leaks in cloud infrastructure? How actionable and customizable are the reports? Reviews and ratings by peers or independent platforms. Professional services & Support availability. Integration with other tools and dashboards. CMPs provide businesses a greater operational agility, and power to identify, analyze, and respond quickly, to changes in your dynamic Cloud environment. To test drive a comprehensive Cloud Management Platform, you could try Botmetric FREE for 14 days here and experience a higher performance from your cloud with enhanced security at much lower costs.